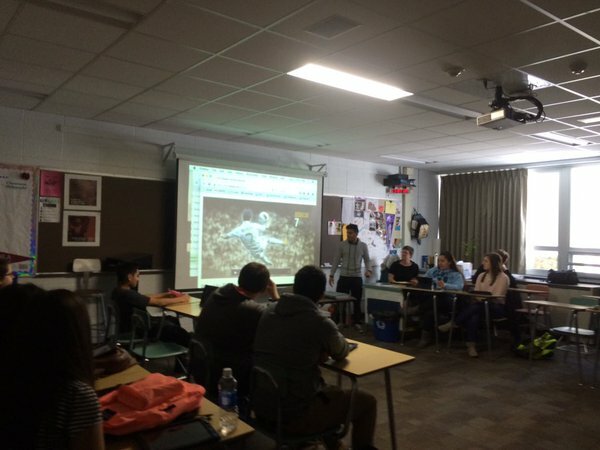 The Collab Blog: Teaming on Tuesdays #2: Student Presentations Made Easy! Teaming on Tuesdays #2: Student Presentations Made Easy! Today was our second Teaming on Tuesday of the Second Semester. Our Teaming on Tuesdays offer staff an opportunity to participate in a short professional learning experiences, as short as ten minutes, that usually involves a brief visit to a classroom to see a strategy in action, followed by collaboration time in the Collab Lab to brainstorm applications in our own classroom and/or "play" with the apps. The American Literature team invited us to observe their students doing presentations with Adobe Voice. 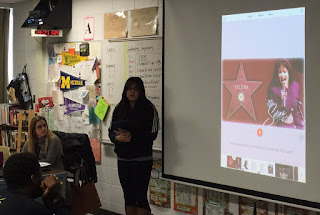 Students projected their creation through Apple TV, but also gave an introduction in person and shared their presentation with their teacher digitally--mainly through a Media Album on Schoology. Much like ShowMe, Adobe Voice allows students to include images and text, then record their voice in the same slide. One advantage of Adobe Voice is that if a student makes a mistake, he or she can re-record one slide without having to record the entire presentation again. When we returned to the Collab Lab, we brainstormed possible applications of Adobe Voice. In addition to presentations, one idea that emerged was to have students summarize the day's lesson in Adobe Voice as an exit slip. They could add one slide a day so that they have a review activity by the end of the week. We also discussed how students could create their own review videos to share with class--a type of podcasting, for example. Other teachers liked the idea of having students take their own photographs around where they live and to create their own "About Me" presentations for their foreign language classes. If you have more ideas and/or examples, please share them with us as the year goes on. Here are some more examples of some of the American Literature students' projects!